NATURAL HABITAT AND PREFERRED SITE: Chinaberry is native of Asia and after being introduced has escaped to grow wild all over Texas. It has now naturalized in floodplains forests, thickets and forest margins. 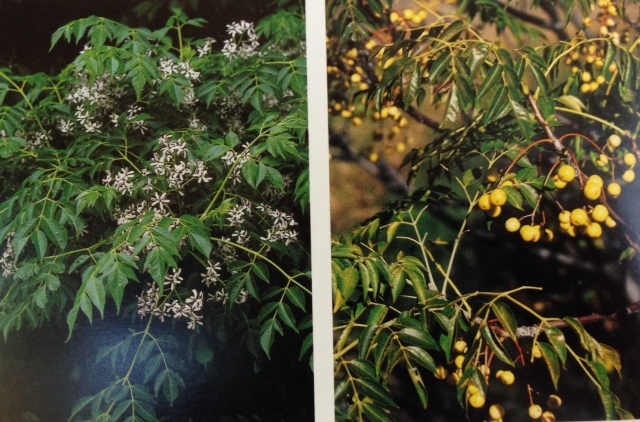 IDENTIFICATION INFORMATION: Chinaberry is a fast growing tree with delicate dark green foliage and strongly fragrant lilac flowers in the spring. FLOWERS AND FRUIT: Clusters of fragrant lavender flowers in the late spring or early summer generally March to May. Fruit ripens in the fall generally September to October, to 3/4 inch in diameter. The fruit is smooth, yellow, translucent and fleshly. There are 3 to 5 smooth black seed in each fruit. Yellow fall color. BARK: Thin reddish brown bark that tends to form strips and become heavier textured with age. FOLIAGE: Leaves are large, deciduous, twice compound and provide have an overall lacy look. Yellow fall color. CULTURE: Considered a fast growing junk tree by many. I like it, although it does not live a long time. Should not be used as a major tree in the landscape. Needs moderate soil moisture. PROBLEMS: Fast growth, short life, brittle wood and sometimes suckers from the ground. Wind damage is also a concern. PROPAGATION: Easy to grow from seed. Fruit is collected in the fall and can be planted immediately after removing the pulp, or can be dry stored for at least a year. Store in glass after treating with natural diatomaceous earth. Chinaberry can also be propagated by root suckers and stem cuttings. INSIGHT: A rancher friend of mine reports that during a summer of heavy grasshopper infestation large numbers of dead grasshoppers were found beneath chinaberry trees having apparently fed on the foliage. Chinaberry is very closely kin to the neem tree Azadirachta indica and appears to have some of the same insecticidal and disease control qualities.